I hope to see you this Saturday at the Third Annual March Against Monsanto! Do you need a reason to march? Here's a recent one... Monsanto wants to spend $45 billion to buy a Swiss company that makes the biggest bee-killing pesticide in the world... banned in many places, but as this article tells you, "widely and controversially" used in the United States. Here's another reason... the revolving door between high-level jobs at Monsanto and high-level government positions. Take, for example, Michael R. Taylor. He's not alone by any means. The government is crawling with former Monsanto execs, and Monsanto is crawling with lobbyists who used to be on the taxpayer payroll. There are many more reasons to protest. Monsanto assured us of the safety of DDT, Agent Orange, Dioxin, PCBs, the list goes on and on. Now they are filling our dinner plates with Round-Up Ready GMO foods that are drenched in their Round-Up herbicide - a glyphosate poison that's made to kill every plant it touches - except for the food itself. Back in the day, herbicides were sprayed AROUND the crops, now they are being sprayed on the crops themselves. The problem is, the weeds around their GMO crops are becoming resistant to the Round-Up, so farmers have to keep using more and more of it. 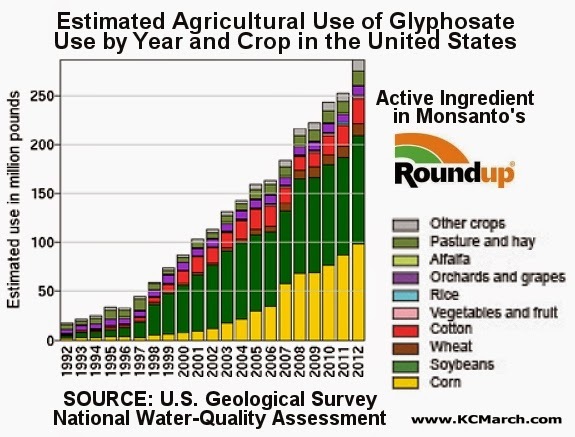 This is good news for Monsanto's bottom line, but it's bad news for farmers who are having to spend a lot more money on Round-Up, and it's even worse news for the human beings who are ingesting Monsanto's Glyphosate Round-Up at ever increasing rates. These are just a few reasons to March Against Monsanto, and it will be going on in more than 400 cities around the world tomorrow, Saturday, May 23. If you're in Kansas City, click here for the details. If you're anywhere else in the world, here is a list of events around the globe, and there's probably one near you. Even if there isn't an event planned close by, you can gather some friends, make some signs, and get out there and inform people! Every year many, many thousands of people find out about Monsanto for the first time just from seeing the marchers.